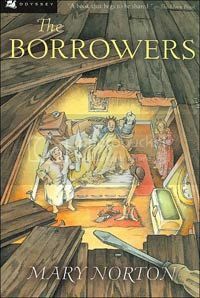 June's OBC book is the Carnegie-Medal-winning The Borrowers by Mary Norton. "The magic and charm of the writing convince children and grown-ups, too, that Borrowers really do exist." - School Library Journal "A rare and delicious addition to children's literature...deserves to take its place on the shelf of undying classics." - Louisville Courier-Journal Also recently adapted by Studio Ghibli into a (gorgeous) anime film, Arrietty. Thread opening on June 1st for discussion; head out and find yourself a copy of the book in the meantime. Leaving the thread unlocked for the week leading up in case anyone who's read it in the past wants to talk about it already. So I haven't read this book in uh... probably a decade...at least. ([act]feels old[/act]) But the hidden-other-world-within-our-own-ness of The Borrowers is something that I've always been attracted to - it's just so fascinating! I love the intricacies of their world - I love the way the Borrowers repurposed things from our world so suit their own needs. There is so much I love about this book - and I really should read it again sometime rather soon. And I may just have to buy it for my 7yo nephew for his birthday, because I think he (and my 24yo sister who reads chapter books to him) would enjoy it immensely. I remember watching the live action movie that was released sometime in the 90s I think? Jim Broadbent and Tom Felton are in it (so I may have just checked imdb just now to check that!) I remember really liking the movie at the time, but again, I haven't seen it in years. Studio Ghibli's Arrietty is absolutely brilliant though - (I remember seeing posters for it on the Tube in 2011 and getting so ridiculously excited for it!) It's such a perfect story for a Ghibli film - there's so many intricacies, and it's just so gorgeous.